DEVECSER, HUNGARY. 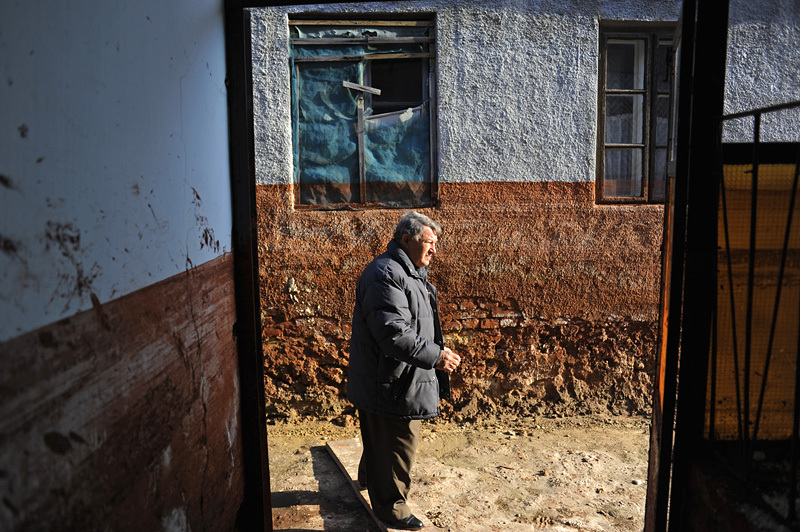 Geza Csenki, 63, outside the entrance of his ruined and uninhabitable home on November 25, 2010, less than seven weeks after an industrial accident at the MAL plant in nearby Ajka, Hungary sent a torrent of toxic red alumina sludge gushing through Devecser and several surrounding villages, killing ten, injuring hundreds and leaving several families homeless. Csenki's efforts to organize demonstrations on behalf of the survivors have been met with an extraordinary response by the authorities who have gone to great lengths to accommodate Csenki and the complaints he has brought forward on behalf of villagers in an effort to avoid official embarrassment.